“World Party Day” a.k.a. “P-Day” is celebrated on April 3rd as a synchronized global mass celebration of a better world. Its aim is for people to achieve social change by celebrating life and partying. The idea for the holiday-like celebration arose from the 1995 book “Flight, A Quantum Fiction Novel” by Vanna Bonta, in which at the ending of the book all the people of the world celebrated at the same time, i.e., April 3, 2000. The concept underlying the celebration is that the opposite of war and suffering should not be passively observed peace, but rather active participation in the celebration of life! 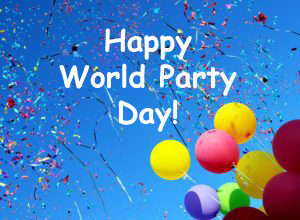 The first World Party Day was celebrated around the world in 1996, and the celebrations have continued ever since. At JD Productions every day is “Party Day” for us. We love to celebrate the special moments in life to create great memories!